Description	 MS in Norwegian and Latin on vellum, Uvdal, Norway, 1636, 30 ff. 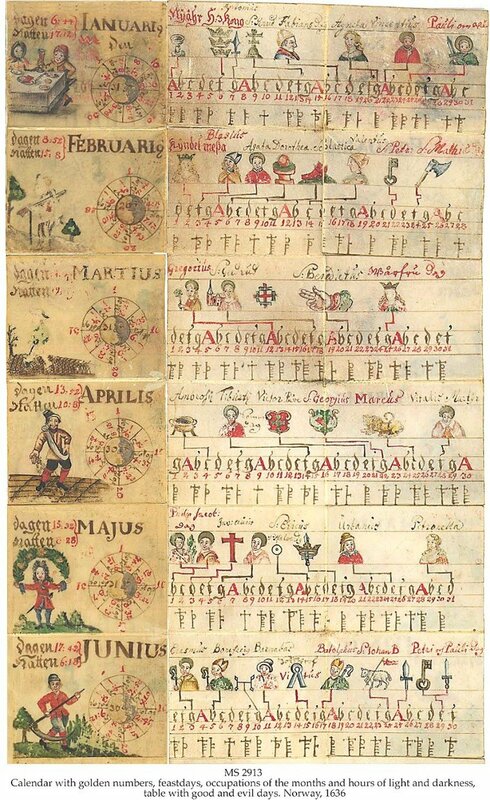 (complete), 5,5x5,5 cm, single column, (5x5 cm), 15 lines in capitals, Norwegian Gothic cursive script and a variant of Roman numbers, 80 miniatures of saints or their symbols, 12 circular diagrams, 12 miniatures of the occupations of the months, all in full colours; the book flattens out into a long strip, 67x11 cm, each section cut and folded around each month. Binding	 Norway, 1636, not bound but plied together to form a book, in its original girdle type leather covered wooden box. 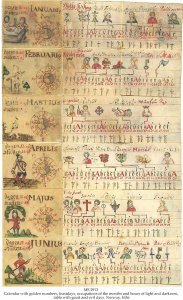 Context	 Very similar to 2 Norwegian girdle calendars dated 1558: the Hegra Calendar in Trondheim, Det Kgl. Norske Videnskabers Selskabs Bibliotek, and the Oslo Calendar, cf. MS 1581. 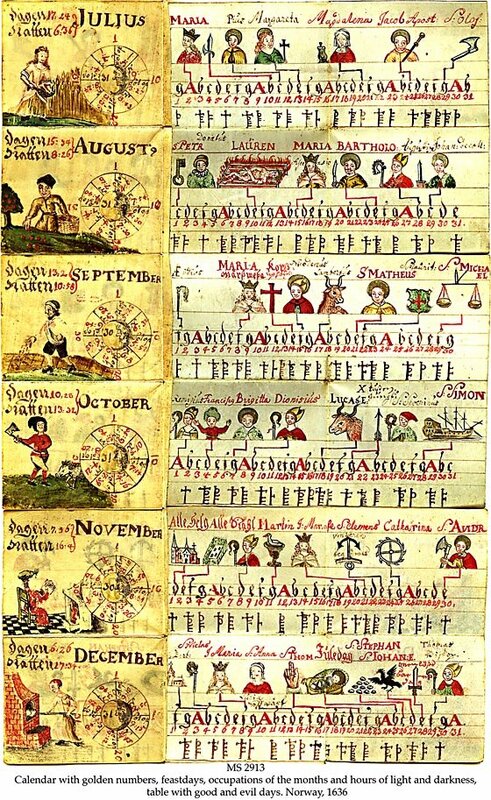 Layout and illustrations are nearly identical, but the two earlier calendars are rather crudely executed compared to the present one. Provenance	 1. Sotheby's (private treaty sale). Commentary	 The feast day of St. Olav, 29 July is marked with an axe and "S. OLOF", as usual in Norwegian calendars. A scribal colophon states: " Er giord i Ufdhall A. 1636", Made in Uvdal anno 1636. In 1696 tables for solar circle, Sunday letters for 1696-1704 and for 1696-1716 were added.